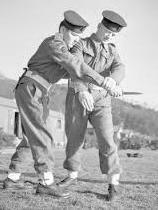 There were many Military training camps in Scotland particularly in areas not easily accessed by or to the general public. As a direct result of heavy casualties being sustained by Royal Naval Beach Parties during the 1942 Dieppe raid (Operation Jubilee), Churchill and his planners knew that when the invasion of Europe began the Allies would need a well trained and equipped invasion force drawing on the resources of all three services. Such was the magnitude of the task assigned to Combined Operations in terms of the numbers to be trained, the diversity of the training and the procurement of equipment that a total of 45 Combined Operations Establishments were set up in the west of Scotland and the south of England. To achieve this objective the Government set up a specialist training camp for Beach Parties of the Royal Navy. Following this decision a Combined Services base was established in Ardentinny. 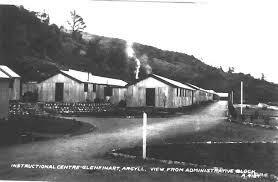 Sited on the site of Glenfinart House, which was requisitioned and designated HMS Armadillo. Initially used as a War Office camp, it transferred to the Royal Navy in 1942, and provided training facilities for Royal Naval Beach Commandos, who should not to be confused with Royal Marine Commandos. The job of the Royal Naval Beach Commandos was to go ashore in the first landing craft and set up a protected base for the Beach Commander to operate from - his job being to control the flow of incoming and outgoing landing craft. Also approved at the time was a proposal made by Admiral Lord Louis Mountbatten, Chief of Combined Operations that the unit created be renamed "Beach Commandos". The training school at Ardentinny accommodated between 500 and 600 men and, unusually for the time, mixed officers with ratings. The principal tasks of the Beach Commandos involved disembarking troops and vehicles from assault and follow-up landing craft, organising suitable beach areas, and loading serviceable returning vessels with wounded and or prisoners of war. Loch Long was used for amphibious reconnaissance and specialised beach skills. Further intensive training included weapons usage, embarkation and debarkation of landing craft under battle conditions, field survival, and exercises such as rock climbing, assault courses, and route marches. Interestingly the Royal Navy Commando's wore Khaki battledress, both officers and ratings, with the appropriate Naval cap. Training usually encompassed a hectic but well organsised 10 week period. The first Royal Navy Unit was formed during the spring of 1942 from general service, reservists and "hostilities only" officers and ratings, and each of the 22 Royal Naval Commando units was commanded by a Commander or Lieutenant Commander and consisted of 10 officers and 65 naval ratings organised into three parties, each of 25 men. In the more advanced stages of training mock landings took place under realistic war conditions. 516 Air Squadron which was based at RAF Dundonald in Ayrshire laid on low level 'attacks' strafing the beaches or laying smoke while landings were in progress. Mortar shells fired from nearby positions and small arms fire completed the hazardous effects. Injuries and even deaths were not unknown during these exercises but the greater need was to give the men a taste of conditions they were likely to face against the enemy. Deaths and serious injury did occur during these realistic training exercises. In 1992, on a training beach at Gortenfern, Kentra on the Ardnamurchan peninsula, evidence of this activity was found in the form of mortar shell casings and .303 bullets dated 1942. Peace and tranquillity have long since returned to this beautiful location and today little or nothing of all this activity remains to be seen. On completion of training and presentation of the prestigious "dagger" badge which was worn with pride on the battledress sleeve, the Beach Commandos were "Key men in the complex machinery of amphibious operations. Each man was require to be able to handle any weapon from a revolver to a heavy gun, drive a vehicle from a motor cycle to a heavy tank and handle any kind of boat from dingy to a tank landing craft. They were to rule the beaches on any landing in enemy territory. Their officer, the Beach Master, who could have been a Sub Lieutenant was effectively in absolute control of any landing. They were to land with the first wave of commandos or assault troops, make a swift "recces" of the beach area and quickly decide whether it was safe for the operation in progress. When the Beach Master had surveyed the full area, he would lie down at the water's edge with his bodyguards alongside facing inland and signal the oncoming craft". (attb. contemporary press report). To provide adequately for future planned amphibious landings, Combined Operations decided that 20 Beach Commando Units would be required. For identification purposes each of the 20 units was assigned a different alphabetical letter. 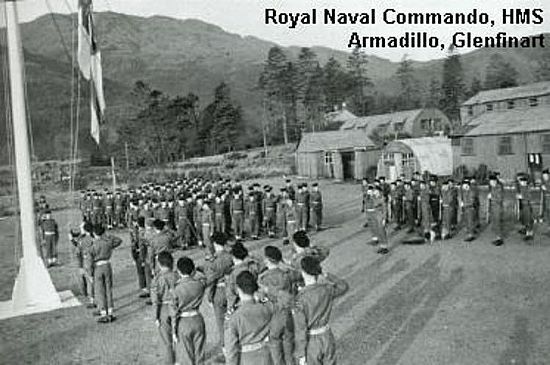 By late 1942, the Royal Navy Commando "M" became the first to be formed and trained at HMS Armadillo. At the beginning of 1943, Canada's senior naval representative in Britain informed his superiors about these Combined Operation units, and even though some 500 Canadian naval personnel on secondment to service in landing craft, he recommended providing a further 100 sailors to form an all-Canadian Beach Commando Unit. In September of that year the Canadian War Cabinet Committee authorised the Royal Canadian Navy to form a Beach Commando and a Beach Signals Section with training in Ardentinny to be completed by the spring of 1944. Ardentinny Church, funded by Douglas of Glenfinart, was built in 1838-9 was designed as a rectangular gable fronted church with a gabled porch and a small bellcote. It is of modest in its design and largely without ornamentation. This would probably reflect well on the status of the village at the time, a small hamlet, reliant on fishing and ferry traffic. The entrance to the church is through a basket arched door with a chamfered aslar surround. The door has a plain fanlight above. Both the main church building and the front porch have saddle-backed skews. The bellcote is sited on a dentilled plinth, with stop-chamfered round arch openings. Entry to the church, provides an immediate air of tranquility, it is largely undecorated, with timber boarding to dado height and plain timber pews. Behind the altar is a dark timber sounding-board and canopy. The flat ceiling at collar height is decorated only with a plain cornice and linear moldings. Where better to remember those Combined Operations Heroes who gave so much for we the future generations. Ardentinny Church has the honour and responsibility to look after and maintain the commemorative plaque which is mounted on the wall. Further symbols of remembrance exist elsewhere with and around the village, remembering those who volunteered for service with their country and were trained here. A photographic record of the Royal Navy Commandos commemorates those involved on a memorial display board established at the beach. When I arrived in Ardentinny some years ago, only two of the original huts remained on the beach area. Outside was the memorial to those who served in the conflict which was to follow. The memorial was well maintained and by its prominence provided a poignant moment for us to those who would not have returned. The area alongside the huts still had concrete foundations of the previous buildings and a set of steps were a good place to stand and think. 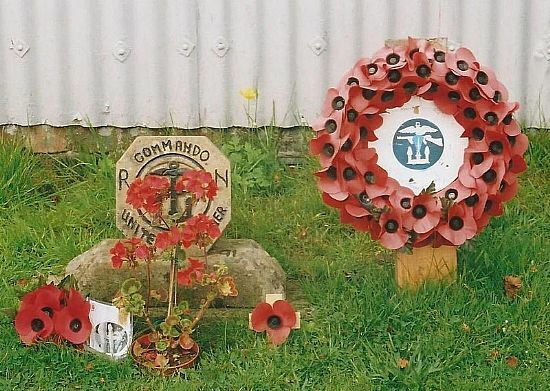 The last remaining huts were demolished in 9th March 2011 and the memorial was re-positioned to the front of the information boards. 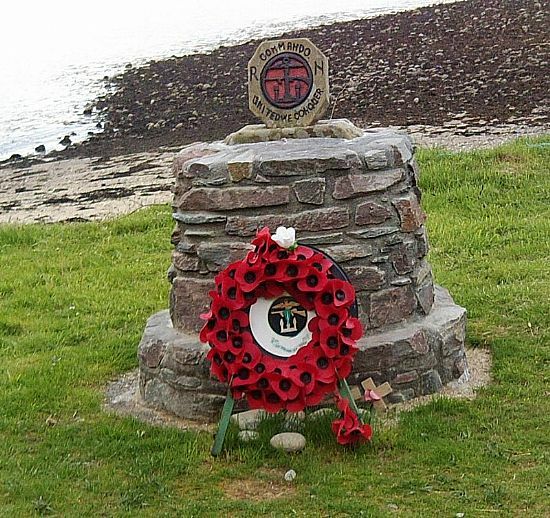 A new memorial cairn was erected in 2013, sited on the area above the beach it is a place to visit and give thoughts of remembrance. In June 2015 a further memorial plaque was added to this memorial. This was in dedication to Harry Smallman, Ken Oakley and all Royal Navy Commandos who served and took part in the planning and execution of the D-Day landings in 1944. 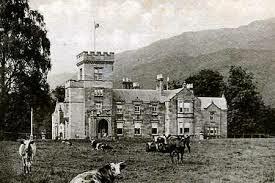 Sadly all that remains of Glenfinart House (HMS Armadillo) is the tower still displaying the Douglas Crest and motto. The grounds are now a quiet residential Caravan Park. My thanks to combinedops.com for the detailed information gleaned from their comprehensive historical database. In a book "Destiny" by Don Brown, there is a tribute to a meeting between Darwin McCloud and William Cameron in Ardentinny Church during 1942. Darwin, a Londoner was under training at HMS Armadillo and visited the Church to worship. William invited him to join his family for lunch. Darwin met Sally Cameron, William's daughter and there is a hint at a blossoming romance. One wonders what became of them and did the romance evolve? Darwin's letters to his mother makes for thought provoking reading.